Last weekend the Wayne State softball team was supposed to travel to St. Joseph, Missouri area to compete in the Hy-Vee Classic, hosted by Missouri Western on Friday, Saturday and Sunday. Due to flooding, the Wildcats competed in the Emporia State Softball Classic on Thursday, Friday, and Saturday in Emporia, Kansas. Last Thursday, the Wildcats played a complete game and won 5-0 against Washburn to improve to 9-6 on the season while the Ichabods dropped to 13-15. Freshman pitcher Makenna Adkison went the entire game and had a complete game with only four hits, while senior leader Abbie Hix brought in all five runs for the Wildcats. “Our leadership this year has really stepped up this year and helped us win those close games,” head coach Shelli Manson said. The Wildcats started off the second inning with a two-run inning, thanks in part of Hix hitting a single up the middle that scored freshman catcher Kamryn Sparks and sophomore infielder Ashley Hernandez. In the fourth inning, Sparks hit a double and later scored when Hix was hit by a pitch with the bases loaded. WSC put the game out of reach with two more runs in the sixth. Sophomore catcher Raquell Penke and Hernandez were both able to score off of Hix’ single to left field. The ‘Cats won the hitting battle with a 6-4 edge over Washburn, and still were able to close out the game with six errors committed. 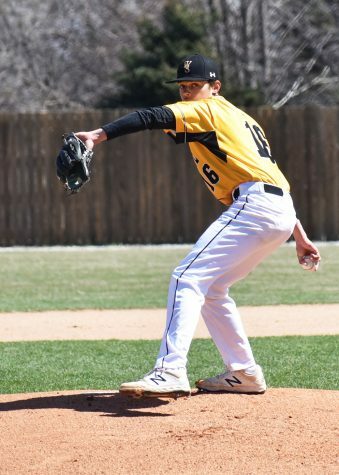 “Both Hix and Hernandez led the Wildcats offensively, Hix went two for two with five RBI’s while Hernandez went two for four with a couple doubles. 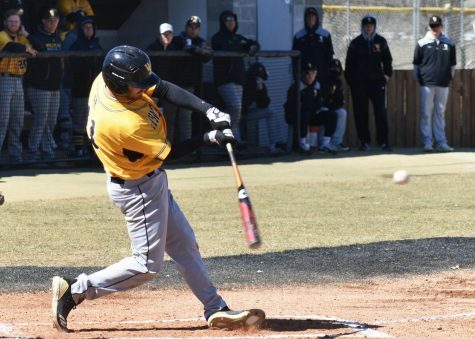 Penke and Sparks both had a hit to round out WSC hits. Adkison gave up only four hits on the mound and earned the win to improve to 6-3 on the season. This was her third complete game of the season and second shutout. 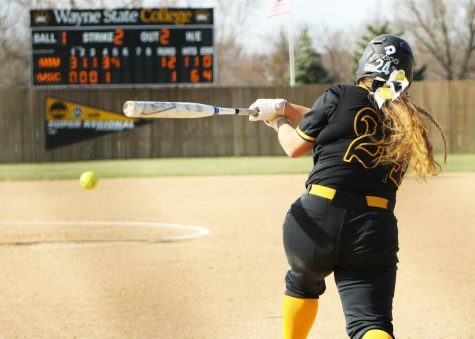 The Wayne State Wildcats softball team’s next game was against host Emporia State on March 21 at 2 p.m. The Wildcats were in control early with a 5-0 lead until five errors led to six unearned runs for Emporia State. The Hornets erased the five run deficit and rallied to pull off the 10-5 win over the Wildcats at the Emporia State Softball Classic. The Wildcats fell to 9-7 as Emporia State improves to 7-15 on the year. 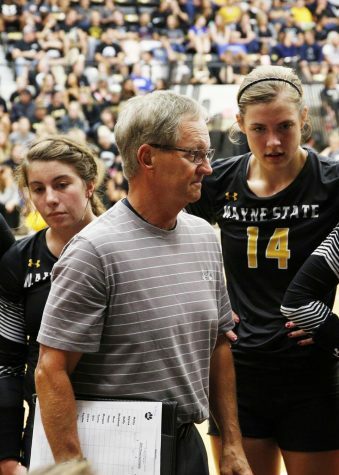 “Our seniors have taken over every role, whether it’s being a cheerleader or starter, they have put the team first and in doing so it has helped us win,” Manson said. In the second inning of this game the Wildcats brought in five runs to take the early lead. Hix started off on fire again and hit a two-run home run to left field, that scored Ashley Hernandez for the first two runs of the game. Senior outfielder Baylee Rial hit a single and scored in Emily Chandler who hit a double and made the score 3-0 in favor of the Wildcats. The Hornets got back in the game with the help of four runs in the third inning, with the help of a couple hits and also a couple of Wildcat errors. Emporia State took the lead for good with a four-run fifth inning on just one hit and on more Wildcat errors. The last run for ESU came in the sixth inning to make the score 10-5. Both teams were even in the hitting department. Hix had another solid day going two for four with a homerun and two RBI’s and Chandler finished going two for two with a double. Senior Morgan Vasa, Buresh, and Rial each were able to add a hit. 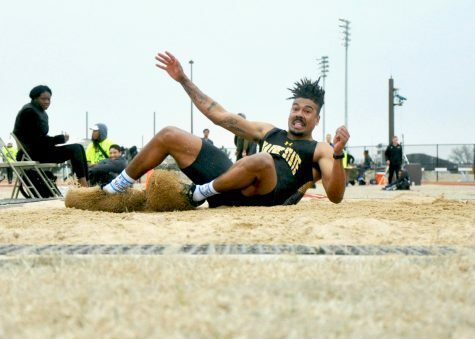 Wayne State faced Northeastern State of Oklahoma on March 22 at 12:30 p.m. The last game of the weekend due to the final two games getting cancelled, saw the Wildcats unable to find any scoring. The Riverhawks shut out the Wildcats with a 2-0 win and improved to 19-12 while the Wildcats dropped to 9-8. The game didn’t see any scoring until the fourth inning when Northeastern State were able to bring in two runs to take the 2-0 lead, which turned out to be all they needed. The Wildcats were right there to score in the fifth inning as sophomore Annie Grammer tripled with only one out but was left at third base as the next hitters had gotten out. Northeastern State lead in hitting with the 5-4 advantage, starting pitcher, Riley Vanderveen, suffered her first lost (0-1) after she was charged with two runs and three hits in 3 1/3 innings pitched. Adkison saw some more action and worked the last 2 innings and gave up only two hits one strikeout. The last two games against Pittsburg State University and University of Central Missouri were cancelled. The ’Cats will be back in action this afternoon at 3 and 5 p.m. in Sioux Falls, South Dakota.